"There are times of change, and in Indonesia we are in the middle of a important culture change." This change effects all areas of life, business, communication and interaction. New generations are coming to the market in Indonesia and they are different in their behavior, in some ways. Mangers face a diversity of cultures when leading people in Indonesia and this is not an easy task. As an expat this comes in addition to the existing cultural differences and this makes it even more challenging. Basically, our job, as a cross-cultural consultant is to observe this, investigate on the changes and the impacts to business and work out solutions for your daily work to cope with the culture. Is there a change in Indonesian culture? Cultures do change, but real impacting changes take a long time or tremendous steps (the Indonesian government tried such a step last year with the "Revolusi Mental" program). Indonesia started to change its political system in 1999 and the social system is still "under construction". Let's assume that a real impacting culture change takes two generations, one generation is 25 years. Now we are in the year 19 after Suharto, in year 14 of a new direct election system, in year 8 of a kind of new school system and in year 4 of a social insurance system. Anyone who was not socialized under the old system (from pre-school onwards) is now approx. 20 - 22 years old. So there is still a long way to go until we see real change impacts on Indonesian culture. As you may know: Culture is not only based on our school or university education. Culture is deeply rooted in beliefs, the socialization and the environment a person is growing up and living in. A person acquires most if its culture from the family, friends and its surrounding and this is what makes an individual’s culture. Cultural values are many times experienced without cognition and that is why we do not question many of our cultural values and just take them as we have learned them. In Indonesia, some cultural basics are far older than the Republic of Indonesia itself and have been passed from generation to generation, because they were either useful to maintain social order or useful from a personal point of view. Just take the examples of the principle of harmony (Rukun), the principal of Discussion & Consensus (Musyawarah & Mufakat), the principle of respect for age and status, the principle of Indonesia's unity, the principle of mutual cooperation (Gotong Royong), the principles of power in Indonesia. These principles are deeply rooted in beliefs, in social values and even in the national ideology. Even children now a days have learned those principles in their family, in pre-school, school and university. We can assume that they will not change that fast or maybe not change at all, even if some Indonesians do study abroad and gain international experience. The majority of Indonesians still runs through the regular social system and even the once coming back from abroad are faced with the challenge to get their new experience in line with the culture in Indonesia. Some of them may succeed and bring some new cultural influence into Indonesia, but many of them simply follow the stream and turn back to their original culture. Another thing is that there is a big difference in Indonesia between urban culture (Jakarta) and rural culture, which we need to consider. Those days, all of these cultures come together in Jakarta and sometimes you will deal with people behaving, thinking and acting very western but at the same time strongly and proudly representing the Indonesian cultural values, when it comes to critical issues (i.e. in case of conflicts people will fall back into their conflict handling schemes they've learned from childhood on, even if they have been trained in other methods). From my experience even the young "Jakartians", which act very western behave in this way. On the outside, towards a foreigner they behave western. They go to western stylish bars, meet westerners and behave western. “Western culture” is cool and easy to some of them. They imitate "western cultural values" (which do not exist at all) by wearing western style clothes, consuming Starbucks coffee, buying iPhones, watching YouTube and talking in English. But taking a look behind the “Western facade” reveals their cultural roots, beliefs and behaviors. Just meet them at another time, with local friends in a small Warung (local food stall). You will see the original culture quick. And so to say: It should be like this and cannot be different. Of course young people are easy to adopt certain things they like and take them as a culture, but being with their family in the village will soon let them forget about all this western thing and bring them back to their original culture. Indonesia is having a rich, diverse and very interesting culture. Currently we are in a very interesting transition period where different cultural values do co-exist, clash, mix up and get sorted out. The people search for a cultural identity, which fits into the 21st century. Many topics are having an impact in this identity search. There is the traditional Indonesian culture, a new democratic movement, the hunt for economic wealth, the striving for knowledge, the cultural influences from China, Korea, Japan, Europa or the US, the religious influence, western lifestyle versus Asian life style, and various others. I am curios to see and learn how this will develop and to which culture it will lead in the end. One thing should not be done. Politics, economy, business should not try to actively steer this process into a certain direction. This can only fail. 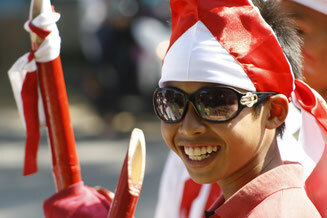 Looking into history, even colonists, politicians or anyone else could not change the real Indonesian culture values. They are rooted so deep in society that many of them will not change. Cultures are of course dynamic, but cultures change slowly and only if the people are willing to change collectively. Sometimes culture just resists change! Oh yes, one thing in the end. Since the late 80's Indonesia sent many young high potentials to study in the US or anywhere else in the world, get a degree at a reputable university and gain international experience. They learned international management methods, negotiation styles, leadership and communication skills there. Those people are the guys, which sit now in the BoD's and BoC's of big Indonesian companies. Did these guys change the Indonesian culture? If you want to learn more about Indonesian culture you may visit one of our training or workshops in Jakarta or simply book an in-house workshop for your company. We offer a wide range on cross-cultural service, training and workshops. In our training and workshops we include a lot of those "new culture" topics, which managers need for leadership in Indonesia.